December 2014 – The African Union’s main base in the Somali capital, Mogadishu, was attacked by gunmen on Thursday 25 December, leading to a further exchange of gunfire between armed men and soldiers which resulted in nine people killed. Among the dead in Thursday’s attack were three AU soldiers and one civilians, the AU mission – known as AMISOM – said in a statement . At least five of the attackers were reported killed and three others were captured. The African Union has about 22,000 troops in the country – from Uganda, Burundi, Kenya, Ethiopia and Djibouti – to help the government battle al-Shabab. Al-Shabab confirmed it had launched an attack on the base. Spokesman Sheikh Abdiasis Abu Musab said its fighters had breached the compound’s defences. At least eight men entered the AU base near the Mogadishu airport, AU Mission in Somalia spokesman Col. Ali Aden Houmed told the Associated Press news agency. The AU force said all of its personnel as well as UN staff were unharmed in the attack, disputing claims from a Shabab spokesman. Somali police official Abdi Ahmed earlier spoke of strong explosions at the rear entrance to the base and exchanges of gunfire. The AU force headquarters is a fortified structure located on the grounds of the Mogadishu airport, which has also been placed under high security and is home for several embassies. 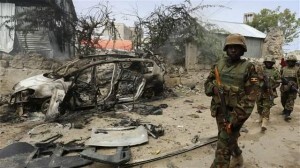 However, fighters continue the deadly attacks in and around Mogadishu. Tagged al shabaab attack, AMISOM, au, mogadishu attack, somalia attack.